Chinese New Year is this week. Why celebrate? It’s filled with a lot of kid fun & it introduces us to different customs & cultures from around the world. It’s an opportunity to take us on a journey of exploration, understanding and mind opening experiences. 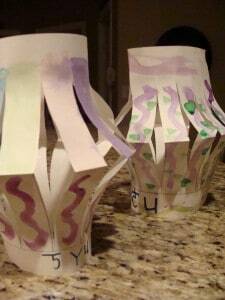 Several years ago we celebrated Chinese New Year and made Chinese Lanterns for fun (well…our version of a Chinese lantern minus the candles. So, I don’t know if technically they are really a Chinese Lantern, but none the less…they were fun & decorative to create). The Chinese New Year, at least in ancient times, actually lasted up to 15 days and has to do with the full moon. One fact that appears to be consistent in our research is that the Chinese New Year always ends with a Festival of Lanterns on the final day. Here is how we decorated for our festival of lanterns to commemorate a little Chinese New Year fun. Step 1: Google Chinese symbols and/or letters to copy. Print them for the kids to follow along. We’ve even tried our best to re-create our names with the chinese letters we’ve found on-line. Step 2: Fold a 8 1/2 x 11 piece of paper in half-length wise. Step 3: We used a ruler to mark off a line on either side of the paper (see below), which is the width of the ruler and runs length wise. Step 4: The children then cut lines with safety scissors from the fold to the drawn line, but not past it. Step 5: We then open the paper & lay it flat. The kids then draw Chinese symbols on the edges. 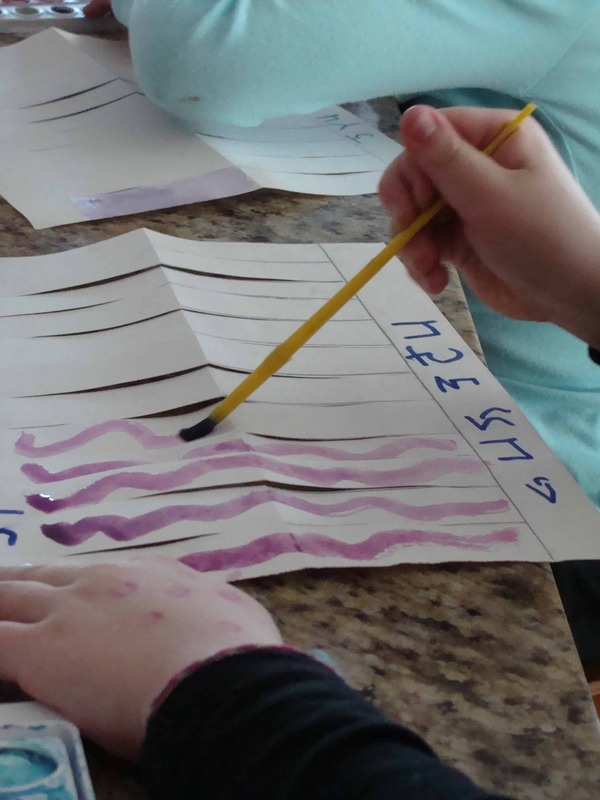 Step 6: This particular year, they used water colors to decorate the cut lines. 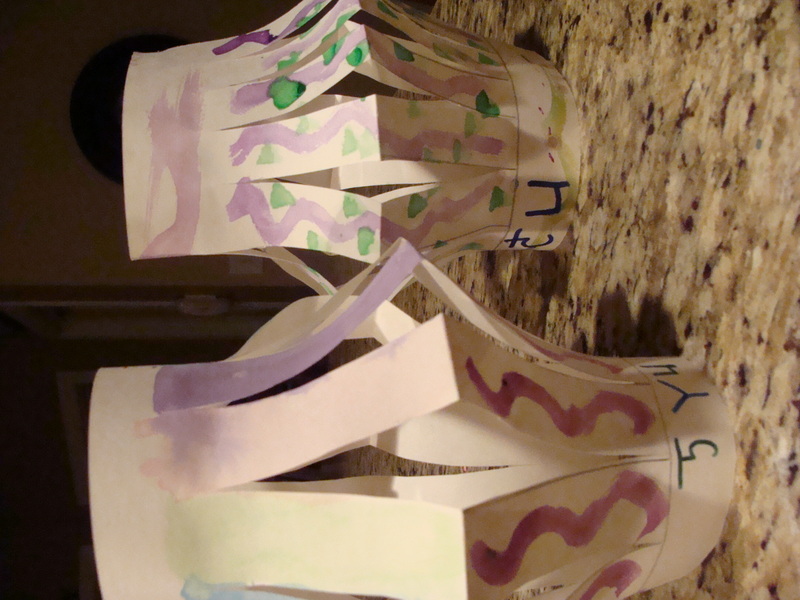 Step 7: We wrap them around, connect them with a staple or tape & voila – decorative Chinese New Year fun! 1. Google & discover they symbol of the Chinese New Year; 2014 is the year of the wooden horse. 2. Google & discover with your Chinese symbol is based on the year and month you were born; we looked up each family member. 3. Google & discover what 2014′s year of the wooden horse means to your chinese symbol. We made these today to get ready for Chinese New Year. They always look impressive.